Computers are not always pretty things. Just take a look at some of the more common desktops and laptops at the lower price range, and you will not be able to deny that they are not the most visually appealing gadgets in the market. It is a whole new story if we talk about Apple computers. Now that is what we call beautiful. Ask other manufacturers – they’ve already made great strides in trying to keep up with Jony Ive and his design prowess. However, it might just be that Apple has nothing on Georges Chirita, a French designer. His specialty is to create computers and related gadgets that are fit for royalty, a gold-plated computer being one of the more eye catching ones. Coincidentally, Chirita is also an electronics engineer – or maybe “was” is more appropriate, for he has turned his full attention to his workshop just outside Paris where he comes up with his bold devices that the average person will probably never have. 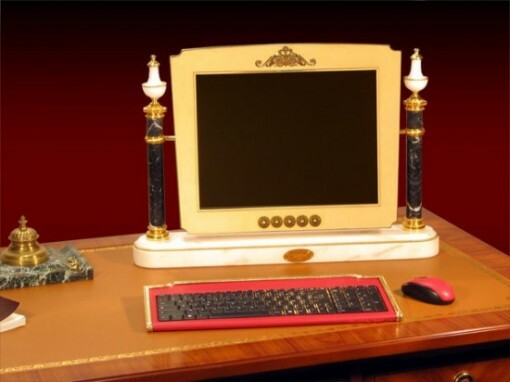 As you can see in the photo above ((courtesy of Oddity Central)), the gold-plated computer is also adorned with marble – at least the base is. In addition to the gold and marble, Chirita also plays around with precious stones. The good news is that the gold-plated computer does work and is actually in step with the latest technology. However, I think that classic French styles may not be for everyone. As beautiful as the set up may be, it would just look weird in the average freelancer’s home office ((the bedroom in my case)), don’t you think?